Spiritual, Emotional, Mental, Physical, Occupational, Social, and Environmental. Sempose Fitness places emphasis on the physical component of wellness by offering various training options and nutrition counseling from a registered dietitian. Our philosophy is centered around asking ‘why’ instead of making a temporary modification that only hides an issue. Let’s figure out ‘why’ an issue is present and then work together to resolve the underlying cause. The idea of SEMPOSE came about from a realization that in attempt to achieve an ideal level of wellness, one must embrace and include multiple dimensions. Often times when an individual reaches a sticking point or just seem unable to achieve their fitness goals, it can be traced back to other areas of life. Our approach begins with putting God first in our lives. Once we place God first, it is easier to align the other components of wellness; Hence, “S”piritual being the first dimension listed. Our goal isn’t to tell anyone what to believe or not, rather we encourage everyone to understand that there is more to this universe than just ourselves. “M”ental wellness. Allow me to share a quick tip with you… this journey will NOT be easy! There will be many bumps along the way. You will trip and fall and then stumble again. You will have days that you don’t feel like getting out of bed. Fatigue? you can count on it. Soreness? probably. Quitting? never an option! You will have so-called friends who laugh at your effort and dedication. This just comes with the territory. When it’s all said and done, you are going to need a heck of a lot of mental toughness to reach beyond your previous limitations. However, the body will do what the mind tells it to do! This brings us to our next dimension. “P”hysical wellness is the fun part. The sweat, the tears, the sacrifices, the temptations. The process, the choices, the effort, the results. I must admit success has never felt so good! That moment when you are forced to go shopping because your body composition has changed and your clothes don’t fit anymore. That moment when your doctor takes you off 3 medications because you have adopted a healthy lifestyle. That phone call you receive from a client who is crying because they realize that you have significantly helped improve their quality of life. This is success that money can’t buy and a promotion can’t replicate. “O”ccupational wellness is another very important factor in overall wellness. An added benefit of being in better physical condition is the ability to work more efficiently. I can’t count the times I’ve had someone tell me they don’t have time to train on a regular basis because of their job demands. Have we forgotten that health is our first wealth? What if you couldn’t walk around the office and supervise without always being short of breath? What if your knees or back bothered you to the extent that you could no longer perform your required duties? Did you know that exercise is actually your gateway to increased efficiency in the workplace? Imagine being able to go to work each day and absolutely love what you do for a living! You would be in a better mood, your efficiency would increase and you would more than likely develop better relationships with your coworkers, family and friends. “S”ocial wellness is essentially your ability to interact with others. This is a great opportunity for us to sharpen our communication skills and remember to have respect for everyone, including ourselves. These characteristics become the foundation of building healthy relationships at work, at home and at the gym. Anyone who has ever trained with Sempose Fitness will tell you that we place great emphasis on community and love clients as if they were all family. Last but not least, “E”nvironmental wellness. As your wellness in all the other dimensions improves, you will instinctively develop a greater appreciation for your environment. After all, it looks like Earth is the only place we have to live; we should do our part to take care of it. Maybe that means you will begin recycling? Maybe that means you will try to use fewer natural resources? Maybe it means that you will set aside time on a regular basis to commit to helping others? Where ever your heart guides you, make certain that you make decisions that contribute to your overall wellness. SEMPOSE is an acronym that has been in the making for several years. It encompasses a deep passion and desire to help others. 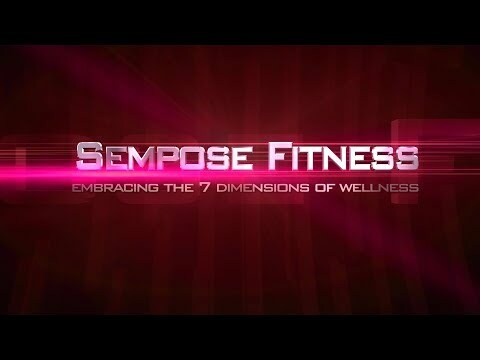 This page is designed to bring awareness to the commitment that Sempose Fitness makes to promoting a healthy lifestyle. To be of further assistance Sempose also provides resources to help people find qualified professionals in multiple wellness related fields. The links listed below are not affiliates of Sempose Fitness and we do not make any guarantees to the services they provide.